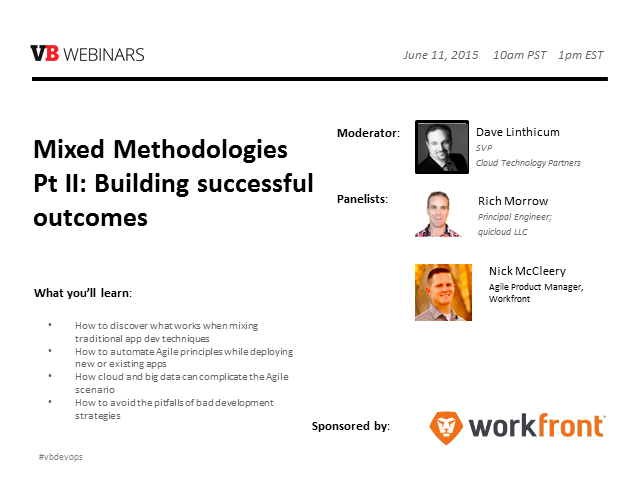 As a second part of our discussion, we dig deeper into the concept that mixing Agile and traditional application development methodologies works well. This time we focus on outcomes, or what we know works. Most importantly, we’ll also talk about what doesn’t work and what should be avoided. Agile has more value in some aspects of the application development lifecycle than others. While organizations are changing around the notion of Agile, it’s healthy to take a close look at what’s practical as to the successful design, development, and deployment of new or existing applications. It’s time to start asking the tougher questions. We’ve got a panel of experts to address the issues around Agile and mixing more traditional approaches with new, from the perspective of the project managers. We’ll deal with the tough decisions that enterprise development project leaders and ISVs have to deal with today as they move to more “modern” approaches. What’s more, look at how the cloud, big data, and the Internet of Things are driving even more innovative thinking around development methods. If you’re moving to Agile, this is a must attend.